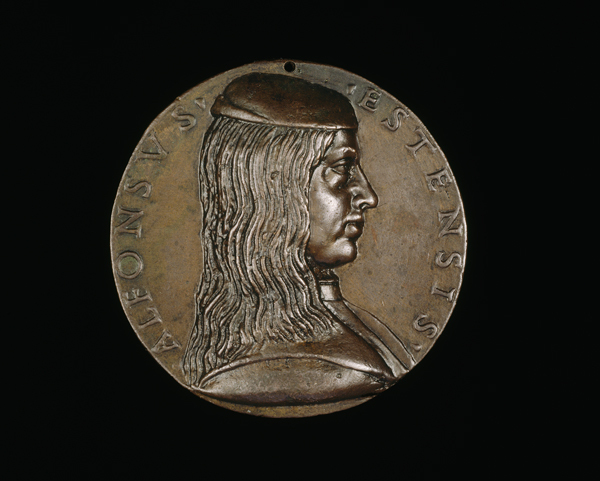 In 1492, when this medal was made, young Alfonso d’Este, age sixteen, was in Florence on his way to Rome. On the reverse, Mars, or perhaps Alfonso as the god of war, sits atop an elaborate chariot. The horses pulling the chariot were copied directly from an antique cameo in the Medici collection. 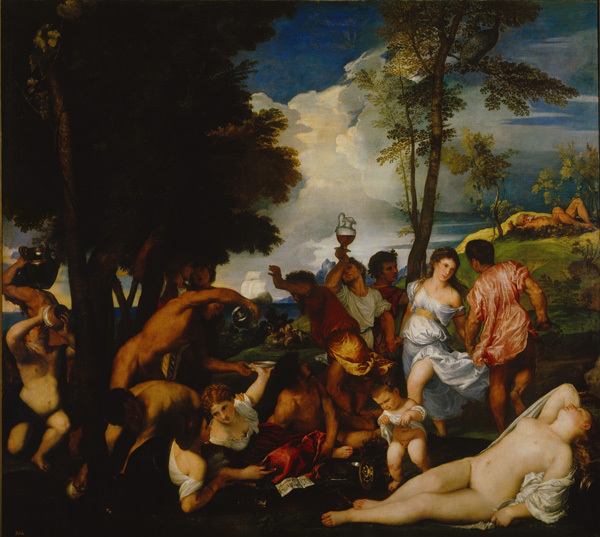 Titian was the consummate court artist, a painter to emperors and popes. Perhaps the letter to his patron, Alfonso d’Este, was meant simply to flatter, but his words also suggest a patron’s powerful role. 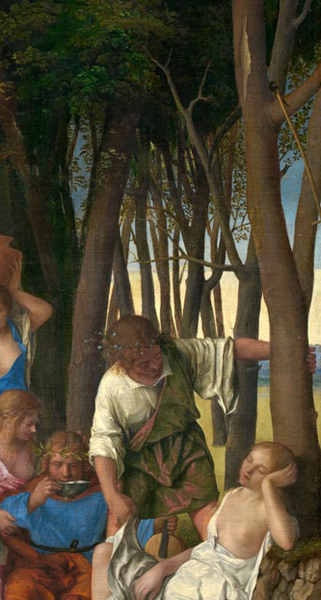 Alfonso commissioned The Feast of the Gods from Giovanni Bellini, who signed and dated it in 1514. It depicts a story told by Roman poet Ovid. To modern sensibilities it is unthinkable that Bellini’s work would be painted over, but that is what Alfonso ordered, twice. 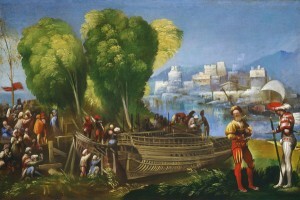 Ultimately it was Titian who brought the painting to its current state. In a real sense, though, Alfonso, as we shall see, must also be counted among its artists. It was made for Alfonso’s studiolo in Ferrara. 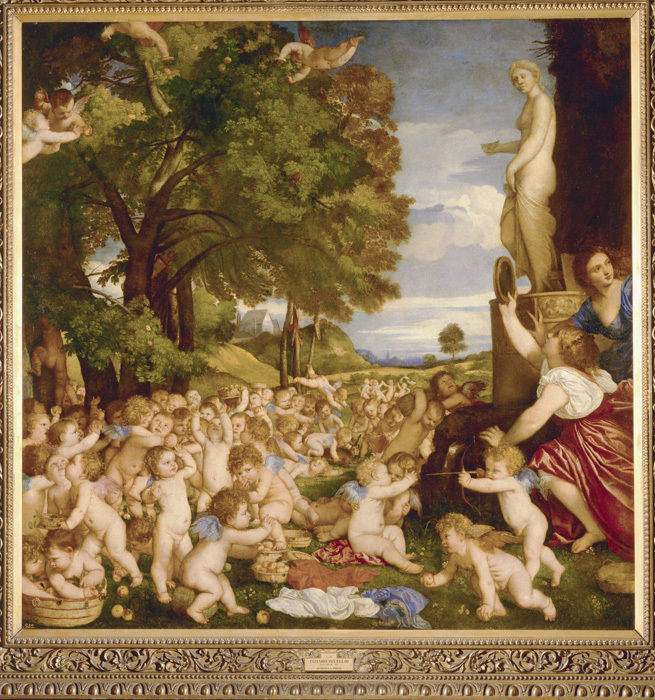 The duke originally conceived an entire suite of bacchanals, and, as his sister Isabella had earlier, he wanted them painted by the finest artists of the day. He contacted Bellini, Raphael, and Michelangelo, all around the same time. 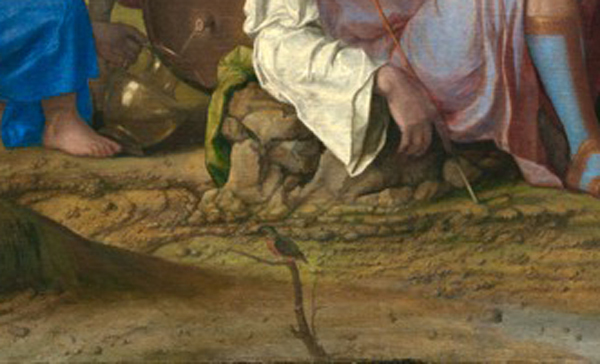 Raphael submitted a drawing, but neither his nor Michelangelo’s commissions ever materialized. 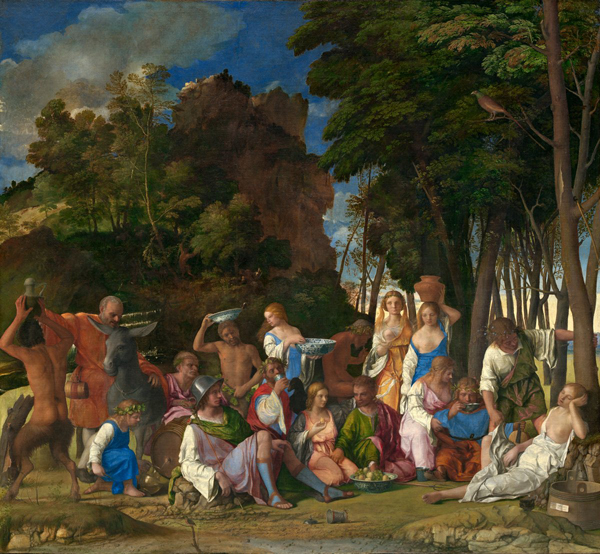 The Feast of the Gods was the first painting completed for Alfonso’s study and the last major work by Bellini, who was almost ninety years old when he finished it. When Bellini died two years later, Alfonso turned to Titian and to his own court artist, Dosso Dossi, to complete the studiolo decoration. 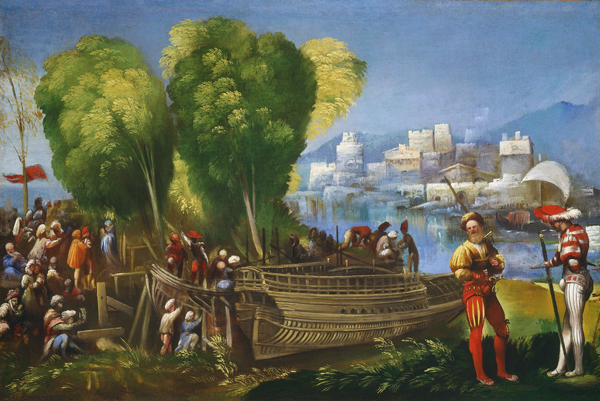 Dosso painted one large bacchanal (now lost) and a series of landscape scenes from the Aeneid. Titian contributed three paintings. 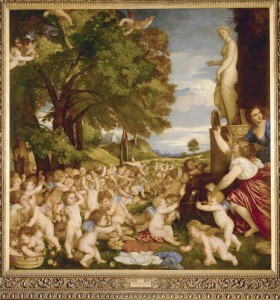 An inventory made when the study was dismantled in 1598 described another work as “a painting by Bellini with a landscape by Titian.” This was The Feast of the Gods. 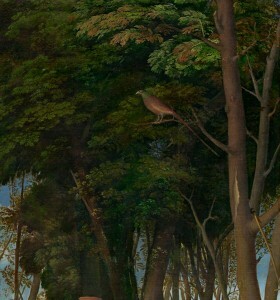 Two distinct styles can be seen in this painting. 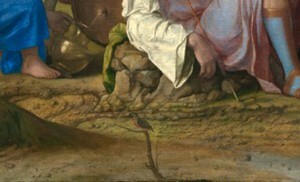 On the right, a screen of tree trunks is thinly painted with the same detailed precision that is found in the figures. This is Bellini’s meticulous style. 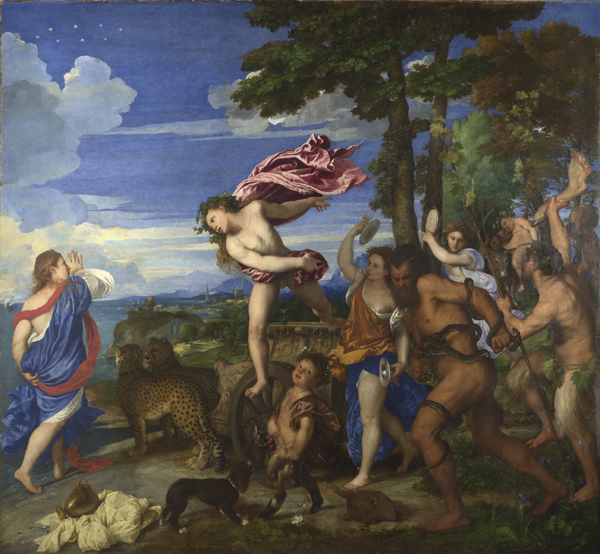 On the left, wild mountain terrain, animated with tiny satyrs and running stags, is brushed in Titian’s freer manner. Dosso’s contributions, it is only this foliage and the pheasant sitting somewhat awkwardly in its midst that were left unaltered. Why did Titian leave such an eccentric detail? It may be that Alfonso had painted the bird himself. He was an amateur painter and even decorated maiolica. It is also possible that bird was simply a quirky reference to himself. The duke was teased about his liking for pheasant in a play performed for him in Ferrara. Some scholars have proposed that The Feast of the Gods, though painted years later, contains cryptic references to the duke’s marriage to Lucrezia Borgia, which took place in December 1502. The kingfisher in the foreground, for example, suggests the halcyon days of calm that occur around the winter solstice. On the left side of the painting, Bacchus is presented as a young boy. He is in his winter guise, like the earth before the growth brought by spring and summer. The story behind The Feast of the Gods is also connected to the solstice. 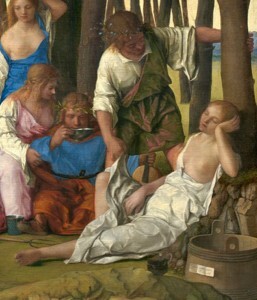 Ovid used it to explain the sacrifice of a donkey slaughtered each winter to commemorate the braying signal that had warned the nymph Lotis, seen sleeping at right, of the lustful approach of Priapus.